Suppose I've selected a run of DNA on-screen and I want to know the base content (the amounts of G, C, T, and A). Bookmarklets of this sort have proven to be a major productivity boon for me in various situations as I cruise the web. When I see data I want to analyze, I don't have to copy and paste it to Excel (or whatever). With a bookmarklet, I can analyze it instantly, sur la vitre. We know that for double-stranded DNA, the number of purines (A, G) will always equal the number of pyrimidines (T, C), because complementarity depends on A:T and G:C pairings. But do purines have to equal pyrimidines in single-stranded DNA? Chargaff's second parity rule says yes. Simple observation says no. Suppose you have a couple thousand single-stranded DNA samples. All you have to do to see if Chargaff's second rule is correct is create a graph of A versus T, where each point represents the A and T (adenine and thymine) amounts in a particular DNA sample. If A = T (as predicted by Chargaff), the graph should look like a straight line with a slope of 1:1. For fun, I grabbed the sequenced DNA genome of Clostridium botulinum A strain ATCC 19397 (available from the FASTA link on this page; be ready for a several-megabyte text dump), which contains coding sequences for 3552 genes of average length 442 bases each, and for each gene, I plotted the A content versus the T content. A plot of thymine (T) versus adenine (A) content for all 3552 genes in C. botulinum coding regions. The greyed area represents areas where T/A > 1. 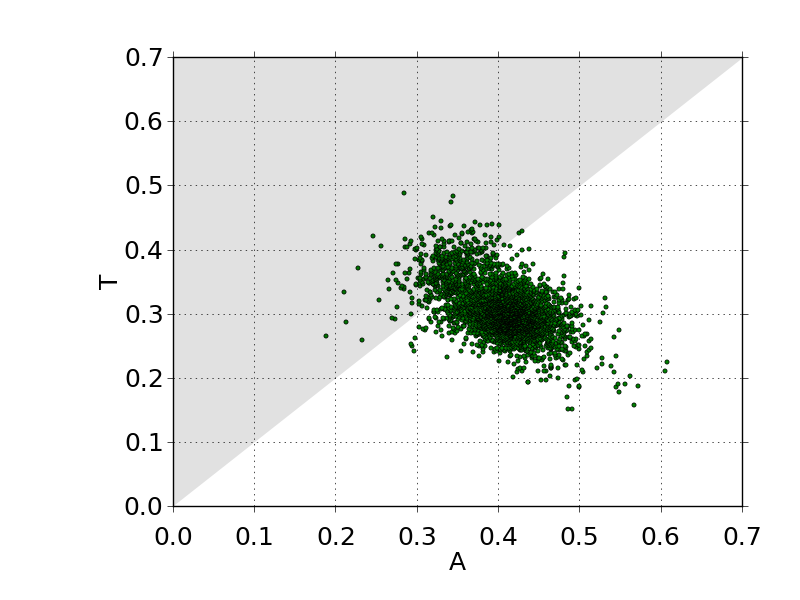 Most genes fall in the white area where A/T > 1. As you can see, the resulting cloud of points not only doesn't form a straight line of slope 1:1, it doesn't even cluster on the 45-degree line at all. The center of the cluster is well below the 45-degree line, and (this is the amazing part) the major axis of the cluster is almost at 90 degrees to the 45-degree line, indicating that the quantity A+T tends to be conserved. 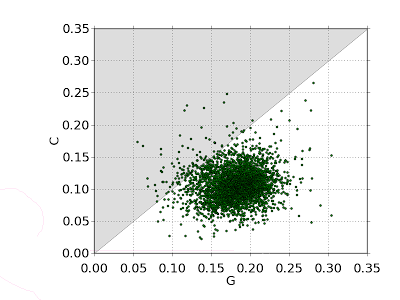 A similar plot of G versus C (below) shows a somewhat different scatter pattern, but again notice that the centroid of the cluster is well off the 45-degree centerline. This means Chargaff's second rule doesn't hold (except for the few genes that randomly fell on the centerline). 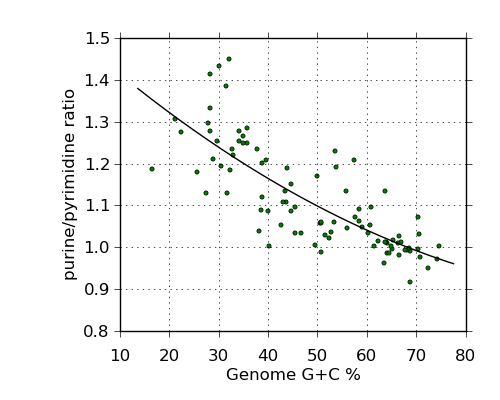 A plot of cytosine (C) versus guanine (G) for all genes in all coding regions of C. botulinum. Again, notice that the points cluster well away from the 45-degree line (where they would have been expected to cluster, according to Chargaff). Amazingly, there are 296,937 more adenines than thymines in the genome (here, I'm somewhat sloppily equating "genome" with combined coding regions). Likewise, excess guanines number 218,938. On average, each gene contains 73 excess purines (42 adenine and 31 guanine). The above graphs are in no way unique to C. botulinum. 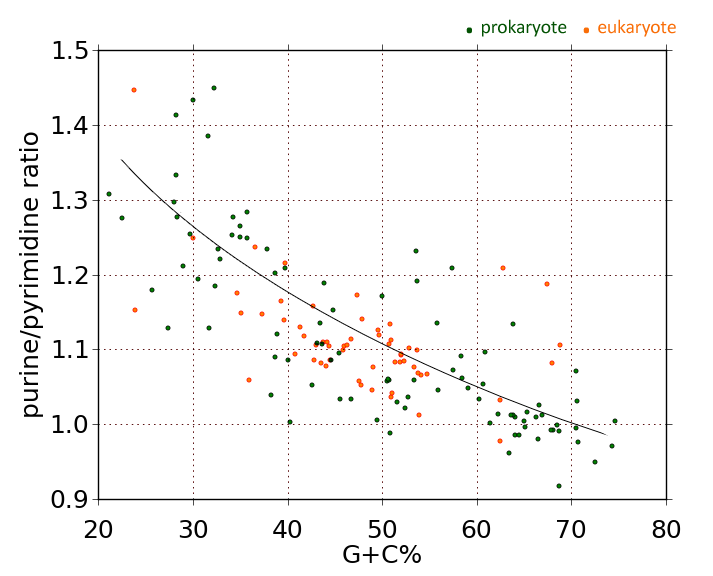 If you do similar plots for other organisms, you'll see similar results, with excess purines being most numerous in organisms that have low G+C content. As explained in my earlier posts on this subject, the purine/pyrimidine ratio (for coding regions) tends to be high in low-GC organisms and low in high-GC organisms, a relationship that holds across all bacterial and eukaryotic domains. Erwin Chargaff, working with sea-urchin sperm in the 1950s, observed that within double-stranded DNA, the amount of adenine equals the amount of thymine (A = T) and guanine equals cytosine (G = C), which we now know is the basis of "complementarity" in DNA. But Chargaff later went on to observe the same thing in studies of single-stranded DNA, causing him to postulate that A = T and G = C more generally (within as well as across strands of DNA). The more general postulation is known as Chargaff's second parity rule. It says that A = T and G = C within a single strand of DNA. The second parity rule seemed to make sense, because there was and is no a priori reason to think that DNA or RNA, whether single-stranded or double-stranded, should contain more purines than pyrimidines (nor vice versa). All other factors being equal, nature should not "favor" one class of nucleotide over another. Therefore, across evolutionary times frames, one would expect purine and pyrimidine prevalences in nucleic acids to equalize. What we instead find, if we look at real-world DNA and RNA, is that individual strands seldom contain equal amounts of purines and pyrimidines. Szybalski was the first to note that viruses (which usually contain single-stranded nucleic acids) often contain more purines than pyrimidines. Others have since verified what Szybalski found, namely that in many organisms, DNA is purine-heavy on the "sense" strand of coding regions, such that messenger RNA ends up richer in purines than pyrimidines. This is called Szybalski's rule. 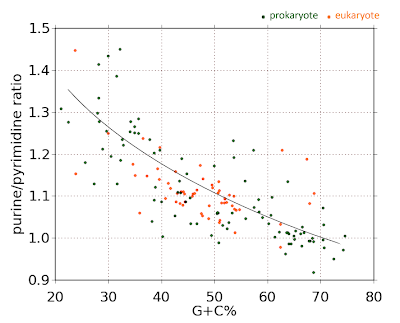 In a previous post, I presented evidence (from analysis of the sequenced genomes of 93 bacterial genera) that Szybalski's rule not only is more often true than Chargaff's second parity rule, but in fact purine-loading of coding region "message" strands occurs in direct proportion to the amount of A+T (or in inverse propoertion to the amount of G+C) in the genome. At G+C contents below about 68%, DNA becomes heavier and heavier with purines on the message strand. At G+C contents above 68%, we find organisms in which the message strand is actually pyrimidine-heavy instead of purine-heavy. I now present evidence that purine loading of message strands in proportion to A+T content is a universal phenomenon, applying to a wide variety of eukaryotic ("higher") life forms as well as bacteria. According to Chargaff's second parity rule, all points on this graph should fall on a horizontal line at y = 1. Instead, we see that Chargaff's rule is violated for all but a statistically insignificant subset of organisms. Pink/orange points represent eukaryotic species. Dark green data points represent bacterial genera. See text for discussion. Permission to reproduce this graph (with attribution) is granted. To create the accompanying graph, I did frequency analysis of codons for 58 eukaryotic life forms (pink data points) and 93 prokaryotes (dark green data points) in order to derive prevalences of the four bases (A, G, C, T) in coding regions of DNA. Eukaryotes that were studied included yeast, molds, protists, warm and cold-blooded animals, flowering and non-flowering plants, alga, and insects and crustaceans. The complete list of organisms is shown in a table further below. It can now be stated definitively that Chargaff's second parity rule is, in general, violated across all major forms of life. Not only that, it is violated in a regular fashion, such that purine loading of mRNA increases with genome A+T content. Significantly, some organisms with very low A+T content (high G+C content) actually have pyrimidine-loaded mRNA, but they are in a small minority. Purine loading is both common and extreme. For about 20% of organisms, the purine-pyrimidine ratio is above 1.2. For some organisms, the purine excess is more than 40%, which is striking indeed. Why should purines migrate to one strand of DNA while pyrimidines line up on the other strand? One possibility is that it minimizes spontaneous self-annealing of separated strands into secondary structures. Unrestrained "kissing" of intrastrand regions during transcription might lead to deleterious excisions, inversions, or other events. Poly-purine runs would allow the formation of many loops but few stems; in general, secondary structures would be rare. The significance of purine loading remains to be elucidated. But in the meantime, there can be no doubt that purine enrichment of message strands is indeed widespread and strongly correlates to genome A+T content. Chargaff's second parity rule is invalid, except in a trivial minority of cases. Erwin Chargaff was the first to notice, in the early 1950s, before Watson and Crick deduced the structure of DNA, that the quantity of purines in DNA equals the quantity of pyrimidines (specifically, the amount of adenine equals the amount of thymine; and the amount of guanine equals the amount of cytosine). This observation was key to establishing the structure of DNA, and it is often cited as Chargaff's first parity rule. But Chargaff also made another observation (the second parity rule), namely that even within a single strand of DNA, the amount of adenine tends to equal the amount of thymine and the amount of guanine tends to equal the amount of cytosine. It's easy to understand why the first parity rule holds true, because complementarity of DNA strands depends on A pairing with T and G pairing with C; these pairings give rise to the "rungs" of the DNA ladder and ensure that copying of strands occurs with total fidelity during cell division. But there doesn't seem to be any a priori reason why the second parity rule should hold true. And in fact, it often doesn't hold true, as Wacław Szybalski noted in 1966 when he reported finding imbalances of purines and pyrimidines in bacteriophage and other DNA samples. Szybalski observed that in most cases, protein-coding regions of DNA tend to have slightly more purines than pyrimidines on one strand and slightly more pyrimidines than purines on the other strand, such that messenger RNA ends up purine-heavy. If you're having trouble visualizing the situation, imagine a very short (12-base) "chromosome" containing 50% G+C content. One possibility is that one strand looks like GGGGGGTTTTTT and the other strand is CCCCCCAAAAAA. In this case half the purines (all the G's) are on one strand and half (A's) are on the other. But you could just as easily have strands be GGGGGGAAAAAA and CCCCCCTTTTTT. In this case, one strand is all-purines, the other all-pyrimidines. Both examples violate Chargaff's second rule, which requires that G = C and A = T within each strand (e.g., GGGCCCTTTAAA + CCCGGGAAATTT would obey the rule). To my knowledge, no one has yet reported the fact (which I'll now report) that the degree to which Chargaff's second parity rule is violated depends on the G+C content of the source genome (at least for bacteria). Simply put, organisms with a G+C content of around 68% obey Chargaff's rules. Organisms with more than 68% G+C content violate Chargaff's second rule in the direction of pyrimidine loading of mRNA. Organisms with less than 68% G+C content (which of course includes the overwhelming majority of organisms) have purine-heavy DNA, to a degree that depends on the amount of A+T in the DNA. Purine/pyrimidine ratio (in coding regions) as a function of genome G+C content based on codon analysis of 93 organisms. As genomes become more A+T rich, mRNA becomes more heavily purine-loaded. The above graph shows how this relationship works. To create the graph, I did a statistical analysis of codon usage in 93 bacterial species. Organisms were chosen so as to obtain representatives across the AT/GC spectrum. No genus is represented more than once. In order to get as broad a sampling as possible, I included 14 intracellular symbionts with ultra-low G+C content (plus one such creature—Candidatus Hodgkinia cicadicola—with a 58% G+C content); many extremophiles; heterotrophs and autotrophs; pathogens and non-pathogens; and organisms with large and small genomes. The complete organism list is presented in a table further below. 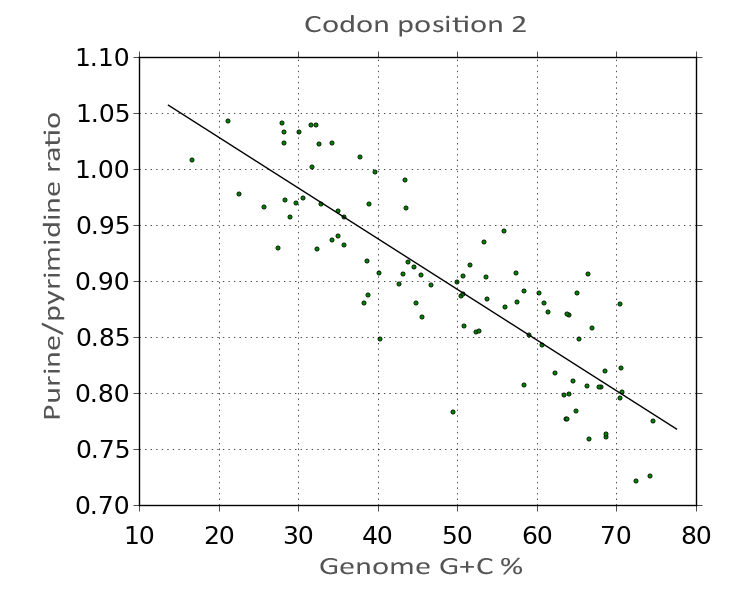 Codon usage statistics for each organism were obtained using tools at http://genomevolution.org. Relative prevalences of A, T, G, and C in the genomes' coding regions were determined by codon frequency analysis. The purine:pyrimidine ratio was simply calculated as (A+G)/(C+T) based on the codon-wise frequency of usage of each base. What we see is that while there is a good deal of noise in the data, nevertheless it's quite clear that purine/pyrimidine ratios increase sharply as genome G+C decreases.Organisms for which Chargaff's second rule holds true (points falling at y = 1.0) are in a small minority. Most organisms have purine-rich coding regions, resulting in purine-rich mRNA. Purine enrichment occurs for both adenine and guanine. For example, in Clostridium botulinum (genome G+C = 28.21%), codon analysis reveals G/C/A/T relative abundances (on the coding strand) of 18.3/10.8/40.3/30.6. 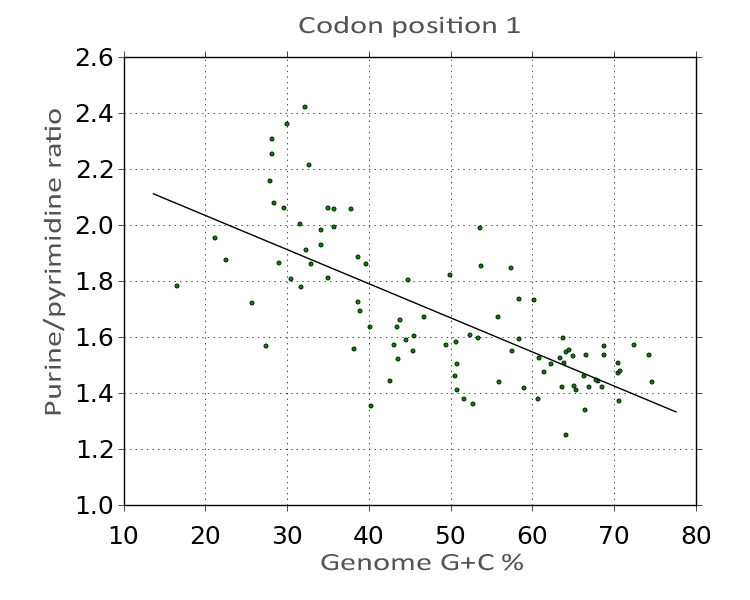 Intra-codon base position analysis reveals that purine enrichment is far more concentrated in position one of the codon than other positions. The graphs below show the purine balance on a position-by-position basis, for each base in a codon. 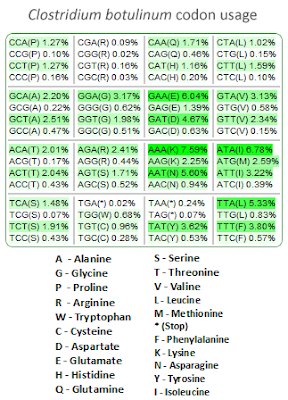 Most of the variation in purine/pyrimidine ratio happens in position 1 of the codon (the 'A' in ATG, for example). Notice that the purine/pyrimidine ratio in this position is well above 1.0 for all organisms. 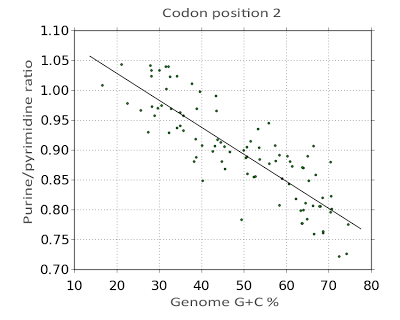 Variation in purine loading at the second position of the codon is more carefully controlled (notice that there is less "scatter" in this graph). The y-axis scale is different here than in the previous graph, hence the slope is quite a bit less pronounced than it looks. Also, notice that most of the points in this plot are below parity (i.e., below 1.0 on the y-axis), indicating that this codon position is relatively pyrimidine-rich. 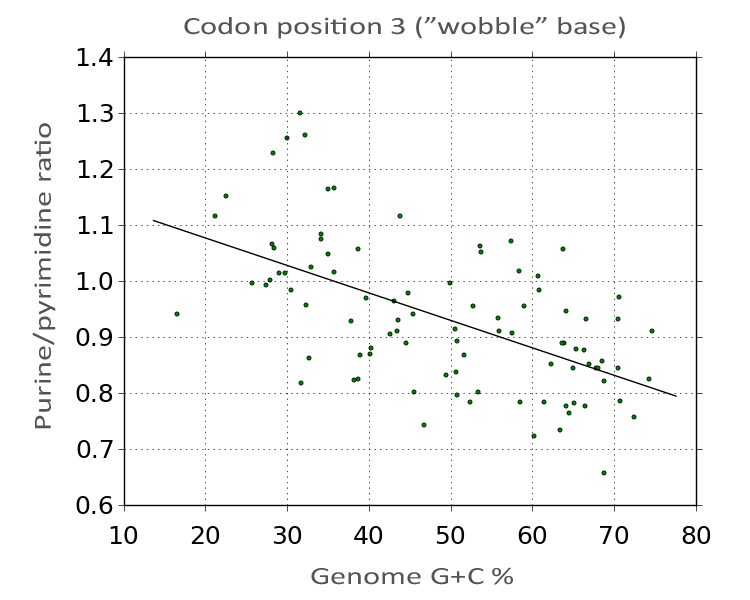 The third (so-called "wobble") position of the codon shows considerable variation in values, but the slope of the curve is less than in the previous two graphs, and this position is pyrimidine-rich for about two-thirds of the organisms. It's well known that GC-skew tends to be exaggerated in position 3 of the codon. 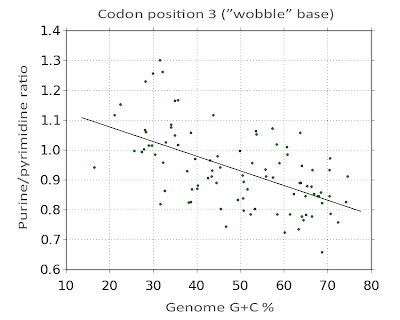 For example, if the overall genome G+C is 70%, the position-wise G+C for the wobble base may be 90%. Surprisingly, we find that purine loading is most exaggerated in position 1 of the codon, not position 3. Not only is the slope of the purine-ratio curve shallower in position 3 than for the other two base positions, only position 1 is actually purine-heavy: positions 2 and 3 tend to be net pyrimidine-rich. This fact (that purine loading is primarily localized to codon position 1, whereas GC-skew is exaggerated in position 3) might indicate that the forces responsible for purine loading are entirely different from the forces responsible for GC skew. What might those forces be? What kinds of selection pressure might cause organisms to purine-load one strand of their DNA? One possibility is that purine loading of the coding strand is a strategy for protecting the "weaker" or more vulnerable strand from damage or mutations. Cytosine is thought to be particularly vulnerable to deamination (and later substitution with thymine, during repair). It's possible that the transcription process (which is asymmetric, in that RNA polymerase operates against just one strand of DNA, leaving the other strand free) is protective of the antisense strand of DNA. That is, in transcription, RNA polymerase cloaks the antisense strand and in so doing renders that strand less vulnerable to deamination events, rogue methylations, etc., while transcription is taking place. An entirely different possibility is envisioned by an RNA World hypothesis. In this hypothesis, the genetic material of early ancestor organisms was single-stranded RNA. Since single-stranded RNA is not "complementary" to anything, there is no need for it to obey Chargaff symmetries. Thus, purine loading could have occurred prior to the advent of double-stranded DNA, and early organisms could have been uniformly AT-rich. In this model of the world, GC-rich genomes are a late development, and the processes responsible for creating GC-rich DNA led to genetic material with full Chargaff base parity. We may not know for a long time (if ever) what the mechanisms of purine enrichment are. But we know for sure that purine accumulation is a widespread phenomenon in the bacterial world (operating across diverse clades) and happens in a way that encourages purine-rich mRNA in organisms with low G+C content in their genomes. DNA is full of surprises, one of them being the radically different ways in which it can be used to express information. We think of DNA as a four-letter language (A,T,G,C), but some organisms choose to "speak" mostly G and C. Others avoid G and C, preferring instead to "speak" A and T. The question is, if DNA is fundamentally a four-letter language, why would some organisms want to limit themselves to dialects that use mostly just two letters? The DNA of Clostridium botulinum (the botulism bug; a common soil inhabitant) is extraordinarily deficient in G and C: over 70% of its DNA is A and T. The soil bacterium Anaeromyxobacter dehalogenans, on the other hand, has DNA that's 74% G and C. Think of the constraints this puts on a coding system. Imagine that you want to store data using a four-letter alphabet, but you are required to use two of the four letters 74% of the time! Suddenly a two-bit-per-symbol encoding scheme (a four-letter code) starts to look and feel a lot more like a one-bit-per-symbol (two-letter) scheme. What kinds of information are actually stored in DNA? Several kinds, but bottom line, DNA is primarily a system for specifying sequences of amino acids. The information is stored as three-letter "words" (GCA, ATG, TCG, etc.) called codons. There are 64 possible length-3 words in a system that uses a 4-letter alphabet. Fortunately, there are only 20 amino acids. I say "fortunately," because imagine if there were 64 different amino acids (as there might be in extra-terrestrial life, say) and they had to occur in roughly equal amounts in all proteins. Every possible codon would have to be used (in roughly equal numbers) and there would be no possibility of an organism like C. botulinum developing a "preference" for A or T in its DNA. It is precisely because only 20 codons out of a possible 64 need be used that organisms like C. botulinum (with a huge imbalance of AT vs. GC in its DNA) can exist. 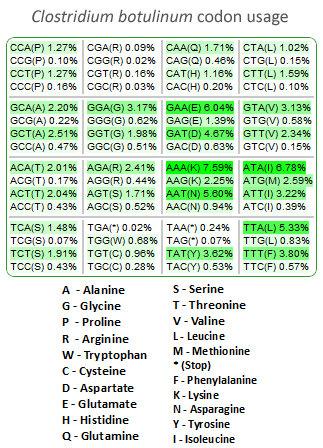 The green-highlighted codons are the ones C. botulinum uses preferentially (with the usage frequencies shown as precentages). As you can see, the most-often-used codons tend to contain a lot of A and/or T. Which is exactly what you'd expect, given that the organism's DNA is 72% A and T.
In theory, a 3-letter word in a 4-letter language can store six bits of information. But we know from information theory that the actual information content of a word depends on how often it's used. If I send you a 100-word e-mail that contains the question "Why?" repeated 100 times, you're not really receiving the same amount of information as would be in a 100-word e-mail that contains text in which no word appears twice. The average information content of a C. botulinum codon is easily calculated using the usage-frequencies shown above. (All you do is calculate -F * log2(F) for each codon and add up the results.) 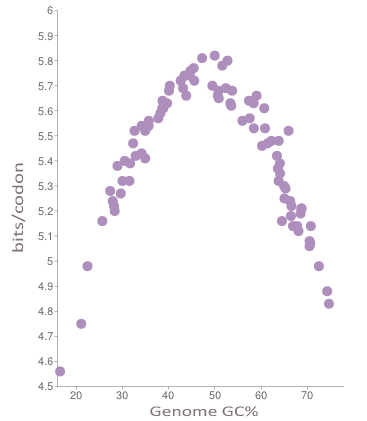 If you do the math, you find that C. botulinum uses an average of 5.217 bits per codon, about 13% short of the theoretical six bits available. One might imagine that the more GC/AT-imbalanced an organism's DNA is, the more biased its codon preferences will be. This is exactly what we find if we plot codon entropy against genome G+C content for a range of organisms having DNA of various G+C contents. 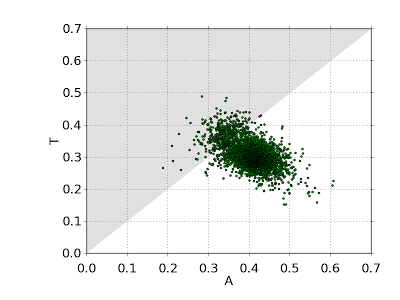 Average codon entropy versus genome G+C content for 90 microorganisms. In the above graph, you can see that when an organism's DNA is composed of equal amounts of the bases (G+C = 50%, A+T = 50%), the organism tends to use all codons more or less equally, and entropy approaches the theoretical limit of six bits per codon. But when an organism develops a particular "dialect" (of GC-rich DNA, or AT-rich DNA), it starts using a smaller and smaller codon vocabulary more and more intensively. This is what causes the curve to fall off sharply on either side of the graph. If you have an observant eye, you may have noticed that the two halves of the graph are not symmetrical, even though they look symmetrical at first glance. 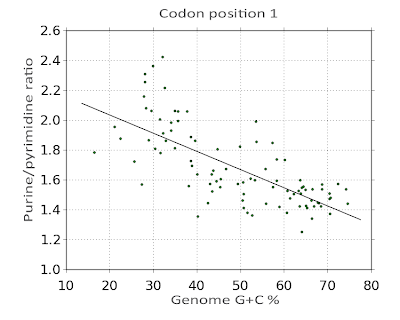 (Organisms on the high-GC side are using slightly less entropy per codon than low-GC organisms, for a given amount of genome GC/AT skew.) If you're a biologist, you might want to think about why this is so. I'll return to the subject in a future post. Back Pain: An Infectious Process? Is Tryptophan Useful for Treating Depression?